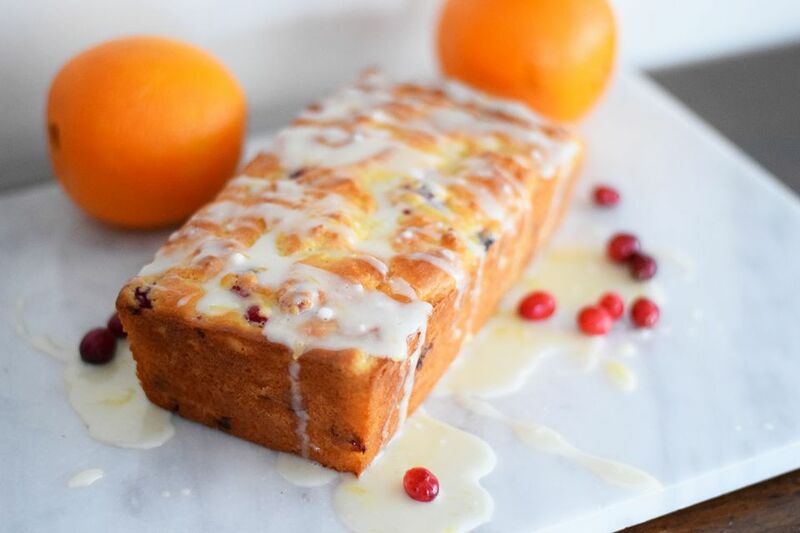 Cranberry Orange Bread is the perfect blend of sweet, zesty orange flavor and tangy, bright cranberries. The smell alone is enough to entice the pickiest of eaters. It is so easy to mix up and looks absolutely beautiful on a breakfast table. It is perfect for the winter season as cranberries are fresh, but can also be enjoyed any time of the year. Top it with the beautiful orange glaze and you will be in heaven. It's super easy to double this recipe and make a loaf for someone who needs a sweet pick me up. It can also easily be frozen and reheated when ready to serve. Fresh cranberries are the best choice for this bread, but if you can't get any, you can always use dried, sweetened cranberries. You may not need as much sugar in the batter if you use the sweetened cranberries. There is more sugar in this bread than most typical quick breads because the cranberries are so tart! You can also easily turn this recipe into cranberry orange muffins! Also, consider topping the bread with a bit of Turbinado sugar (the coarse grain sugar) to create a crunchy crust! Cool your melted butter to room temperature (oil may also be substituted). Beat together the egg, milk, sour cream, vanilla, orange juice, orange zest, and melted butter together in a mixing cup. Make a well in the center of the dry ingredients. Pour the wet ingredients into the well, mixing as you pour. Completely combine the ingredients until you have a batter, be careful not to overmix. Mix in the cranberries. As it sits, it will thicken slightly. Grease a loaf pan with nonstick spray or butter. Pour the batter into the loaf pan, spreading it evenly. Bake the loaf for 25-30 minutes depending on your oven. Test the doneness with a toothpick; if it comes out clean, it's done. While the loaf is cooling, whisk together the powdered sugar and orange juice. Once the loaf has cooled, drizzle the glaze over the top, slice and serve.